Swimming in the pool or in the sea can be a lot less fun if you cannot see where you are going. Whether just in for a splash, or some serious swimming wearing your prescription swimming goggles will let you see the view. Being keen scuba divers ourselves, we appreciate you optical needs better than most.Corrective lenses can be permanently bonded to either you own diving mask, or we can provide a prescription mask as a complete item. Alternatively, the Mythos diving mask with a clear one piece tempered-glass front visor into which you can insert your Optisub personal prescription is another option. Also single use contact lenses (one day) are often an excellent way to enjoy good vision both on the dive and above water. Indoor racket sports demand a high degree of eye protection, which is catered for by this virtually indestructible nylon spec. Held securely in position by an adjustable headband, comfort is assured by a soft, built-in silicon saddle bridge. (Suitable for wearing under head shields.) Available in Adult and Junior sizes. Your personal prescription is made up in impact-resistant polycarbonate lenses to offer great protection and sharp vision. 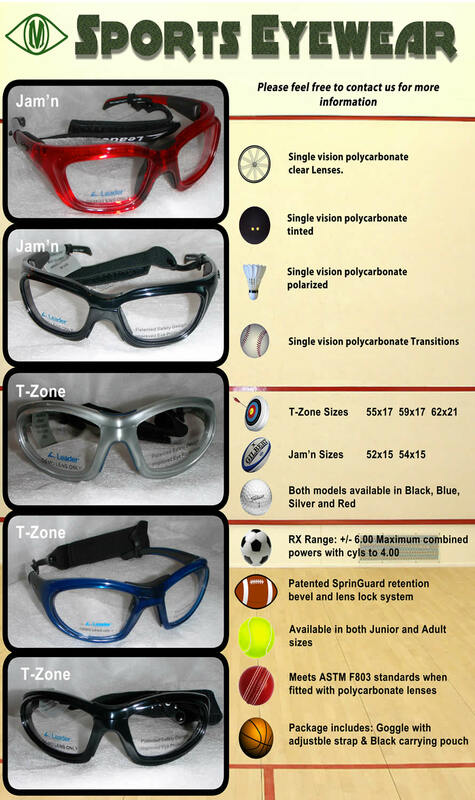 Multi-sports activity spectacles, various styles with or without headband. Adult and junior sizes, suitable for helmet wear. Your personal prescription is made up in impact-resistant polycarbonate lenses. Allsports Goggles, with their special crystal clip-in lenses, offer wide vision and excellent protection against flying particles and cold wind. Steaming up is minimised by adjusting the special air vents (ideal for skiing). The replaceable front shield is grey polarised. (Clear shield is available on request). Useful for many sports i.e. Hang-gliding, power boating, horse riding motorcycling etc. Complete with drawstring carry bag. These classic spectacles have a high fitting and very wide field of view. Tinted orange Serengeti Vector lenses for extra high contrast ensure that the clays stand out against the sky. Silicon curl sides for secure fit. Fashionable, yet functional sportswear for cycling and other active sports. Virtually unbreakable polycarbonate lenses protect your personal prescription lenses, which are fitted into a special holder. Snooker Specs offer clearer unrestricted vision for the game thanks to their specially angled joints, large eye sizes and lightweight resin prescription lenses. Interchangeable locking components allow for highly specialist use and versatility in the Target Specs, thanks to fully adjustable lens position. Special accessories such as irises to improve depth perception and opaque side shields to remove all potential distractions are available as extras. World Record Holding and Champion rifle, pistol and crossbow shooters have worn both the Target and Shooting Specs for many years. UV light is harmful to your eyes and is believed to contribute to the formation of cataracts, that's why all Matheson Optometrists Sunglass ranges come complete with UV 400 treatment. UV 400 ensures that 100% of harmful UV light is absorbed making your sunspectacles safe to wear on even the sunniest days! Sunglass tints are a popular choice on prescription lenses allowing you to see clearly in bright sunlight. Fashion tints and tints to protect light sensitive eyes are also available in a wide range of colours.